The orthopaedic literature reports wound complication rates as high as 13% for surgical repair of a ruptured Achilles tendon, with 3% to 5% of patients needed a reoperation. The problem is the definition of “wound complication” was not clear in all these studies, so it is hard to know if the reported percentage of complications is correct. Steven M. Raikin, MD, from The Rothman Institute in Philadelphia, Pennsylvania, had the impression that the wound complication rate for his patients was much lower than 13%. To confirm this, he and his colleagues closely reviewed the records of 369 consecutive acute Achilles tendon ruptures treated by Dr. Raikin with direct end-to-end repair from August 2000 to May 2014. Overall, the wound complication rate was 9%. But when Dr. Raikin and his colleagues broke down the complications by group, the percentage of patients who needed further treatment was less than 3%: 2.44% for minor complications (group 3) and 0.54% for reoperation (group 4). 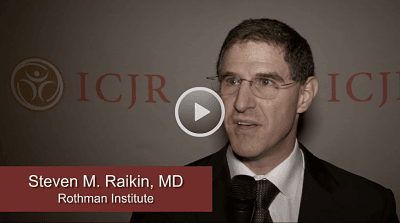 Click the image above to hear Dr. Raikin review the study, “Wound Complications After Primary Open Achilles Tendon Repair” (Paper 396), which was presented at the 2016 Annual Meeting of the American Academy of Orthopaedic Surgeons in Orlando.